I'm a huge fan of quirky, off-beat films and cult movie classics. 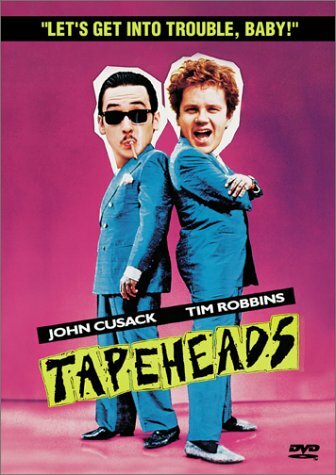 Tapeheads is just one in a long line of such movies, which also includes the Blues Brothers, Harold and Maude, and The Rocky Horror Picture Show. I've enjoyed Tapeheads hundreds of times over the past 20 years, and still can't get enough! So what makes Tapeheads a classic? #1 - It's the time period. Remember the 1980s? It was the time of big hair, MTV and music videos. MTV promoted bands such as U2, the Eurythmics, Blondie, Huey Lewis & The News, AC/DC and Def Leppard. Band members wore spandex pants, leather vests, and bandanas around their hair. Tapeheads includes all of this and more. 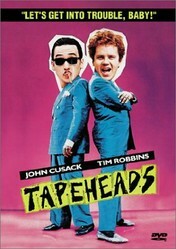 Tim Robbins and John Cusack are the stars of the show. The chemistry these two actors share shines through their roles, and makes the movie that much more hysterical! From the "Blender Children"; to "Roscoe's Chicken and Waffles", to "Baby Doll" by Cube-Square; and the "Swanky Modes"; you'll experience a parody of the type of music videos produced in the 1980s. This is a story of two nerdy friends working as security guards. Josh (Tim Robbins) wants to break into the music video business. He dreams of becoming a producer, but doesn't really know where to begin. Ivan (John Cusack), doesn't know anything about the movie or music business, but is a slick talker with a lot of ambition. When they get fired from their security guard gig, they decide the time is right to pursue their new career. They begin producing music videos and commercials, all of which are disastrous. Using paint, pyrotechnics, and bad animation, Josh and Ivan continue on their quest for the perfect music video. When they are about to give up their dreams, along comes the Swanky Modes. These two guys were legends, and Josh knows that if he produces their video, not only will the Swanky Modes regain their fame, but Josh & Ivan will be successful. This is definitely a movie that you need to watch with someone else, as there are so many jokes, quotes and one-liners that you'll want to repeat over and over. You'll hear them repeat the alphabet backwards (omitting all vowels while using sign language), or say "Yo kids, check this out";. You'll find yourself singing "Waffles are just pancakes with little squares on them"; or "Baby Doll". If you enjoy classic videos like Tapeheads, you'll also enjoy the Blues Brothers! Like Tapeheads, the Blues Brother movie is full of fun, music, star power, and humor. A cult classic like no other, the Blues Brothers are on a "mission from God" to make enough money to save an orphanage. Have you seen Tapeheads? Which movie is your favorite all-time cult classic?